Our thanks to Al Hulin for sending in this charming account of a 19th-century picnic at the original (now submerged) Croton Dam, from the archives of the Newcastle Historical Society. 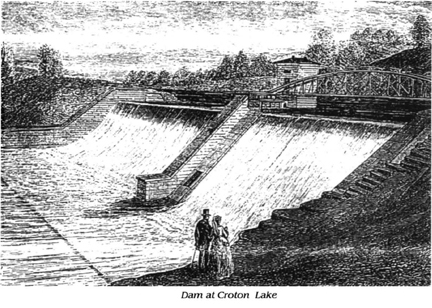 "Gabrielle (Greeley) and I have just returned from spending the day at Croton Dam. A large party from the prominent families of Chappaqua was organized by Miss Murray, the pretty daughter of one of our neighbors, and at nine o 'clock a number of carriages, packed to overflowing with young people and lunch-baskets, and led off by a four-horse wagon, started caravan-wise from the place of rendezvous, Mr. Murray's elegant grounds. "The drive was a very pretty one, skirting for some distance the beautiful little lake that supplies the great thirsty city of New York, and the spot chosen for the picnic-shady, terrace-like heights, with a gradual slope to meet the water, and a rough beach here and there-was declared the most suitable place to lay the cloth. One or two members of the party remained behind to unload the carriages, count the broken dishes, and estimate the proportion of contributions- many people fetching salt in abundance but forgetting sugar, whilst others furnished elaborately frosted cakes, but omitted such necessaries as knives and forks. Meanwhile, we climbed the stone steps leading to the waterworks, and after a glimpse of the seething dark-green water through the heavy iron grating, we hunted up the overseer and asked him to unlock the doors for us that we might have a near view. He assented and admitted us very obligingly, giving us meantime a graphic description of the yearly journey of the Inspector in a boat down the dark passage to New York, and pointing out the low, narrow place of entry for the water-house where they must lie down in the boat." - extract from 'The Story of a Summer or Journal Leaves from Chappaqua," written by Cecelia Cleveland, niece of Horace Greeley. Entry dated June 26, 1873.